Hit by the Same Problems Below When Planning Your Wedding? we will first draw some sketches to get your approval and then turn them into 3D figurines. 100% Handmade - One of a kind, handcrafting the special moment only unique to you. 100% Matching - Each cake topper is special designed to match your wedding perfectly. 100% Satisfactory - Sketches are emailed to get your approval to ensure 100% satisfaction. at 2D sketch designing stage to Guarantee 100% Match and Satisfaction. You worked with us until it was what we wanted! I was extremely happy and satisfied with my cake topper. Everyone at the wedding continues to comment on it. They thought the likeness to us was great. The fact that we had the lapel patch with our ski club logo on the Grooms tuxedo was awesome. Thanks fun deliver for a superb product and such great attention to detail. We were pleasantly surprised that the flowers were so vibrant and really matched the actual flowers, dress and tuxedo. I was very pleased with the service provided by your company. I highly recommend everyone to purchase from you. Thanks again for a great wedding topper. Our figurine became the Highlight of the whole event! I used the figurine as a cake topper for my husband's 50th birthday and believe it or not, the cake became the highlight of the whole event. The figurine you made for my husband exceeded our expectations..It was perfect! All of our guests were amazed with your work. we now have it displayed in our curio cabinet. I attached some pictures here for you to see, you may use them as your future reference. Again thank you and I hope for your great success in your work. Everyone LOVES our cake topper! As far as my experience with FunDeliver, it was such a positive one. The pictures on the website help so much. I probably spent three hours on your site before I ordered my topper. You kept in touch with me on almost a daily basis. That really helped. The pictures of the progress were well-timed. It helped to have pictures at each step so I could ok things like the colors of the clay. I also appreciated the way you'd respond to the changes I wanted to make to the faces, the shape of the ears, etc. and then send more pictures to make sure the changes were fine. Your emails were always positive and reassuring - wording was comforting. I was always excited to see an email come in from you. The ordering process and confirmation process were easy. The FAQ document and sample pictures were helpful. Thanks so much, again, for this wonderful sculpture. Everyone who has seen pictures LOVES this item and I hope you get some referral business from us. Still doubt? Fine, check below to get FREE 2D Sketch Designing Service without paying any penny! January 1, 2011 6 Years. With 6 years experience specialized in customized wedding cake toppers and personalized figurines, we have enjoyed tons of amazing love stories and wedding ideas. We treat them as the greatest treasure of the whole world and think they should be shared with everyone. However we also take our clients' privacy very seriously, without your approval we never publish your photos. So we release this free 2D sketch designing service to encourage you to share your unique love stories and wedding ideas. 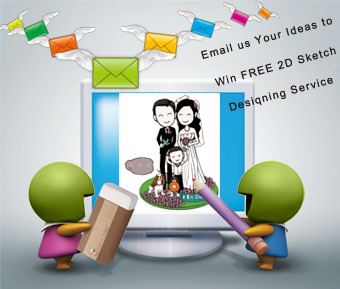 Please click here to know more information about How to Apply For FREE 2D Sketch Desigin Service. We really appreciate for your participation. Thanks. Now eager to create your own cake toppers and figurines? Wait, some homework is necessary and will help us to sculpt better artwork. Read our Photo Guidelines to prepare reference images. Good images are crucial for our projects. Take a look at Service Process and Real Order Processing Procedure to know how you will be serviced. Don't worry, check our product list below to bring you some inspiration and ideas. Remember, FunDeliver.com do Not just Deliver cake toppers and figurines, but Fun!